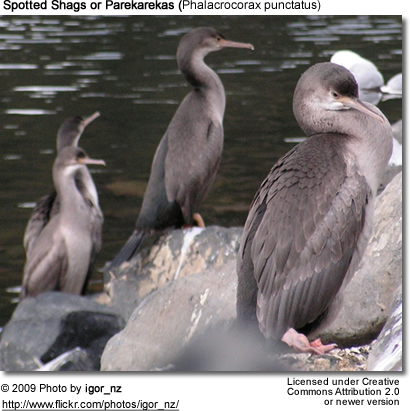 The Spotted Shag or Parekareka (Phalacrocorax punctatus, also occasionally called the Spotted Cormorant) is an attractive species of the family Phalacrocoracidae found only in New Zealand. Originally classified as Phalacrocorax punctatus, is sufficiently different in appearance from typical members of the genus Phalacrocorax that it has in the past been placed in a separate genus, Stictocarbo, along with one other species, the similar Pitt Island Shag. 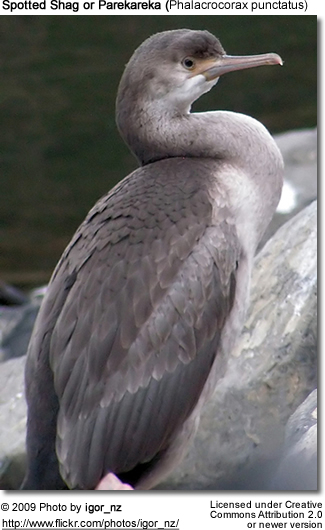 Compared with typical cormorants, the Spotted Shag is a light-colored bird. Its back is brown. Its belly is pale blue-grey (often appearing white), and the white continues up the sides of the neck and face, but the throat and the top of the head are dark blue-green. In the mating season, it has an obvious double crest. There is little sexual dimorphism (visual physical differences between the sexes) . Spotted Shags nest in colonies of 10-700 pairs, these colonies are generally found on the ledges of coastal cliffs (see photo at left) or on rocky islets. In the South Island, they are particularly readily observed around Banks Peninsula; there is a large nesting colony immediately south of the city of Christchurch. In Wellington Harbour there is a large colony on a a rocky outcrop known as "Shag Rock" just off the south-west end of Matiu/Somes Island.